Why not give a gift filled with delicious memories. 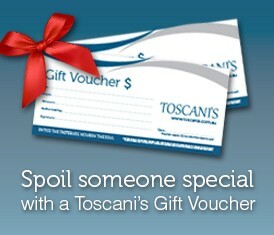 A Toscani’s gift voucher is the perfect idea for any special occasion. Available in any denomination amount you choose they are easy and convenient. To purchase a gift voucher simply visit one of our restaurant locations or fill out the request form below. Upon receiving your enquiry a representative will contact you within 24hours to confirm the order and process the payment. *Personal Message - Please limit messages to a maximum of 80 characters.